Looking for ways to eat pasta without all the pasta?… try Spaghetti Squash. It’s packed with nutrients including folic acid, potassium, vitamin A, and beta carotene. It’s also low in calories, carbs, and sugar, yet it will leave you feeling like you seriously just ate some homemade pasta. 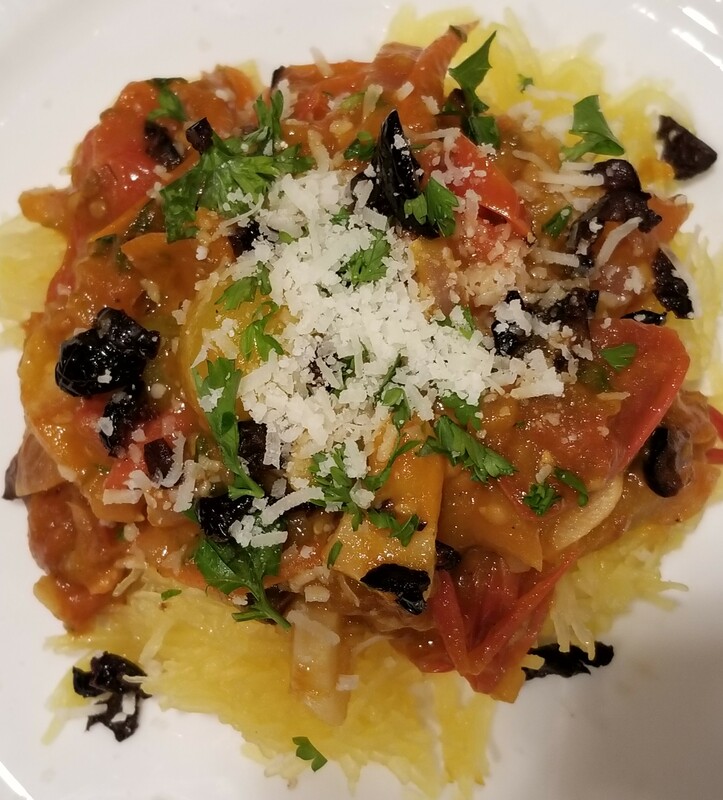 For dinner last night we made Spaghetti Squash with Heirloom Tomato sauce, and it was delicious. It’s hard to convince Ron to step outside the box with food…but he went back for seconds. Cut the Spaghetti Squash length wise and remove seeds. Rub with a little olive oil and sprinkle of salt. Place upside down on baking sheet and cook at 400 degrees for 40-50 min. While the squash is cooking, peel and slice the garlic, rough chop half the red onion, split the tomatoes into halves, chop the parsley, and chop the olives. In a sautee’ pan heat 2 tbsp olive oil and satuee’ the garlic and red onion over medium heat until it begins to get a little soft. Then add the tomatoes and bring it to a simmer. Add a dash of salt, pepper and the red pepper flakes and give it a stir. Add 1/2c water bring it back to a simmer and put a lid on the pan for about 5 minutes. Remove the lid and start to stir. As the water reduces the sauce will start to thicken. Keep stirring until it becomes the thickness you want (I prefer it to be pretty thick). Once there turn off the heat and add in most of the parsley and olives, reserving a little for garnishing your plate. When the squash is done remove from oven and rake a fork over the inside of the squash, it will start to come off very easily and will look like spaghetti strands. Plate the squash and top with the sauce. Garnish with reserved olives, parsley, and a sprinkle of fresh grated parmesan. The left-over squash will store in a container in the fridge for up to a week.